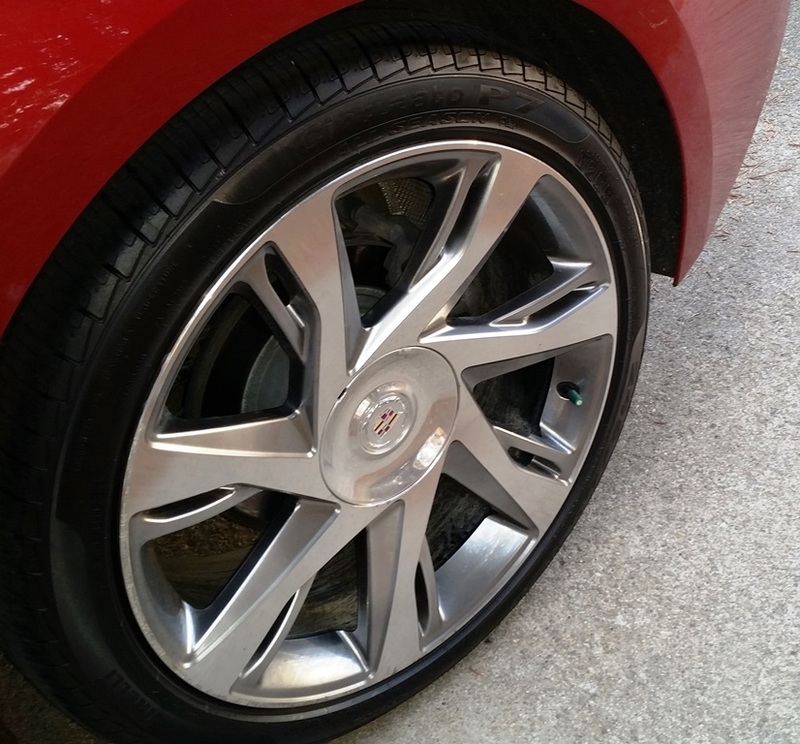 At 20K, the Bridgestone Potenza RE97AS tires on my ELR are done. I can't wait to get them off my car. Both are down to 2/32 in the front, 4/32 right rear, 8/32 left rear - that tire was replaced by Firestone last February. These won't make it through a winter here in Pittsburgh, and the RE97AS is one of the lowest rated tires on Tire Rack. Car has had regular rotations starting at 7322 miles, and every 7500 miles after that. Long story short, the OEM Potenza tires have a no mileage warranty, and wear out is not covered by the bumper to bumper warranty. Been shopping for tires, and I'm looking for a good tire that's good in the wet, light snow, and has a reasonable mileage warranty. Looking at the Pirelli Cinturato P7 All Season Plus, Continental ExtremeContact DWS 06, and the BF Goodrich G-Force Comp-2 A/S. Leaning towards the BFG as I detect some of Michelin technology from the Pilot Sport series trickled down to the Comp-2 A/S – and they are at a competitive price point. No Michelin tires were available in a 245/40R20, I'd have to bump up to a 245/40R20. A really tall tire like that would look a little odd on the ELR. Re: Time for replacement tires for the ELR - advice? While I'm still running the OEM Potenza tires on my '14 ELR, when the time comes I fully plan on replacing them with the current version of Continental ExtremeContact DWS tires. I've had the Conti's on several cars, including my Lexus SC430 and my GF's Mazda 3... and I plan on them being the replacements for the OEM Run-Flats currently on my '15 Corvette Stingray. I have nothing but great things to say about the Conti's... Great wear/longevity, excellent handling, as well as a noticeable improvement in both ride comfort and road noise reduction. Hope this info helps... Best of luck! I have the 20 inch OEM Dunlop SP Sport Maxx GT tires on my 2016 ELR. They are mainly a summer performance tire and the ride is fairly firm. They are OK I guess but if I were ready to replace them, I'd probably go with Michelin Pilot Sports or Super Sport tires. Not sure where you were looking for the Michelins but they definitely are available for the ELR. Try searching tirerack.com. djpinaz and djpinaz like this. No Michelins available at TireRack in a 245/40R20, quite a few at 245/45R20. I would go with the lowest rolling resistance Continental you can get. I put Contis on my daily, and they're going on the Volt next. I will throw my vote in for the BFGoodrich g-Force Sport COMP-2. From the research I have done, these seem to be the best all-around option. 245/40ZR20 are available at Sears for 184.71/ea. Have about 900 miles on the BFG comp2 a/s. Working quite well. Some extreme temp swings here in SW PA. Inflated to 37 psi cold. Excellent traction. Great value for an ultra high performance all season tire. I have 37K miles on the OEM Bridgestones on my 2016 ELR. Fronts are below 2/32", rears are maybe 4/32. Are you still happy with your BFG comp2 a/s? 2 years later you probably have 24,000 miles on them now? How are they wearing? No snow here in So Cal, but we had a lot of rain the last 2 months!! My 2016 needed new tires at 20K as well - EV's eat tires. As was mentioned, if you care about range, make sure you go with low rolling resistance tires. I did not, and my summer electric range went from 44 miles to 37 miles after the tire swap. As the tires wore, I got back up to 39. Great traction with the new Goodyears, but if you want to keep your electric range, absolutely be sure to get low rolling resistance type. Hi coffee4matt - after 25 K on the BFG tires, I bought a set of Pirelli Cinturato P7 All Season Plus tires from Tire Rack this past December. The Comp2 tires were getting pretty loud, and occasionally would break loose - not very confidence inspiring. The P7 tires have a 70K warranty, and are a low rolling resistance tire, so I hope to get at least 50k out of them. They are really quiet compared to the OEM Bridgestones, and the BFG rubber. Have about 5200 miles on them already, wearing evenly and about time for a rotation. I've had no issues in the rain with these tires, contrary to some negative reviews on Tire Rack. Could be due to the low center of gravity thanks to the battery. I'd think about replacing your tires soon if they are worn that low...Good luck!